Fruit trees can be planted year-round in the conventional manner – that is, buying a potted tree, taking it home, digging a hole and putting the root ball in the ground. However, ‘bare-root planting’ is a method that is easier on both the planter and the tree. Bare-root methodology is not restricted to fruit trees – many people prefer to plant their roses and other shrubs bare-root as well. Bare-root simply means buying – and planting – a dormant tree that has been excavated and transported without soil or pot – hence ‘bare-root’. A good bare-root tree is one that has a balanced, undamaged root system (not one-sided) and an intact tap root with no cracks. As long as the roots are kept moist and the tree is replanted while it is still dormant, ‘baring’ the roots can be done with no harm to the tree. There are numerous advantages to bare-root planting – the plants are generally cheaper, as they are much lighter to ship than trees with heavy soil attached. They are easier for gardeners to transport, as well. Perhaps the most important advantage is that the trees will grow their new roots entirely in native soil, and not have to contend with transition between dissimilar soils. 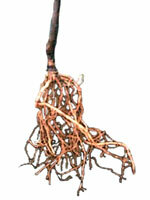 Finally, the ideal time to plant bare-root is now – when most other garden chores are not demanding your attention. If you won’t be able to plant the trees for more than two days, the trees should be “heeled in” by temporarily planting in a moist medium such as compost, wet shavings, sand, garden soil or a pile of wet leaves. Trees recently planted in containers may be treated as bare-root if purchased in December through late January—they may be removed from the container and “re-bare-rooted” for planting. Come March, however, it is best to let the trees grow in the can until late summer/fall when the root ball can be pulled out of the can intact without disturbing the roots. Dig a hole about l foot deep and fill it with water. Let it drain, and then fill it again! Since the most important issue in planting a fruit tree is drainage, it is essential to also know whether the soil is fast-draining or - more common in Sonoma County - slow-draining. Fast-draining soils can dry out quickly in hot weather. Slow-draining soils can become saturated by rainfall or landscape watering, starving tree roots of oxygen. Poor drainage is particularly troublesome to cherries and apricots, but can be a challenge for almost any kind of fruit tree. Understanding drainage helps in selecting the right rootstocks or helps the nurseryperson determine what rootstock to recommend. Further, understanding and managing soil drainage is the number one means of ensuring that a fruit tree starts well and has a long healthy life. If your soil is a heavy clay type, then adding a few shovelfuls of amendment, such as compost, will help loosen the soil and improve drainage. Dig a planting hole wider than deep—3’-4’ wide is probably enough to allow the root system to spread naturally - and deep enough to cover the root when planted, either at soil grade level or slightly raised as discussed above. Water thoroughly and ensure that any air pockets are filled in. Remember to MULCH!! Any organic matter will work. Keep it a few inches away from the base of the tree and cover the area under the canopy, spreading the material about 3-4 inches deep. This can be very effective in helping to maintain consistent soil moisture. Newly planted trees will benefit from a wash of water-based paint diluted with water. Paint the trunk from the ground up to the first branch. It’s good insurance against sunburn and will also help protect the tree from borers. Fertilizer is not necessary at planting time, but might be recommended for later in the growing season. Staking is generally not necessary either as there is no heavy root ball or crown to secure. Bare root trees are in the nurseries right now – Urban Tree Farm in Fulton, Harmony Farm Supply in Sebastopol and most other full-service nurseries will have a good supply.